Guyanese pancakes are different from the traditional flat pancakes and this is due to the Portuguese influence on the country's cuisine. 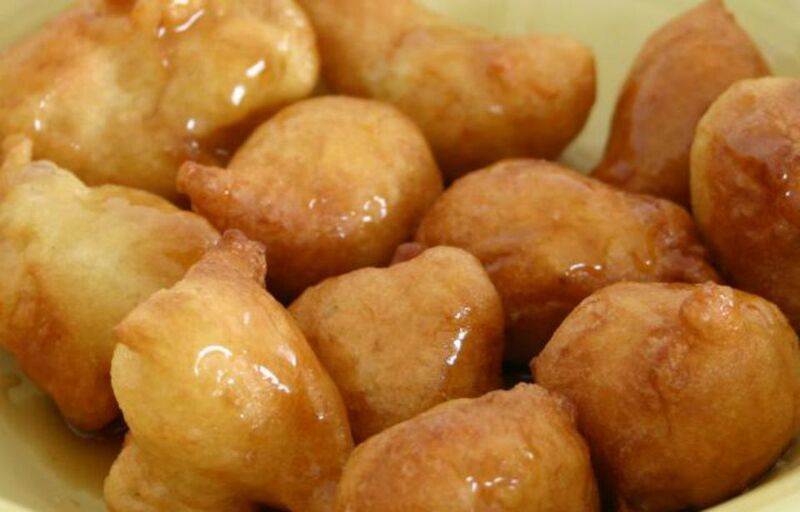 In Portugal, these pancakes are known as Malasadas (a Portuguese-style fried doughnut). These pancakes are made and served on the Tuesday before Lent. Once you have one of these pancakes, you feel compelled to finish the entire lot. They are that good. They are meant to be served with homemade syrup. Add flour, sugar, salt, yeast, and cinnamon, if using, to a large bowl and mix thoroughly. Add the eggs and vanilla extract to a small bowl and whisk gently (you just want to break up the eggs and get them mixed with the extract). Make a well in the center of the flour mixture, pour in the eggs and milk, and stir to mix and make a smooth, thick batter. Cover and let rise in a warm place for 1 and 1/2 hours or until the mixture has more than doubled in quantity. Add oil to a deep frying pan and heat on medium heat until oil is hot (350 F). Working with 2 tablespoons, scoop and drop the batter into the hot oil. Do not overcrowd the pan. Let fry for 1 minute until nicely browned all over. Remove using a slotted spoon and drain on paper towels. Serve warm with a generous drizzle of homemade syrup.